This is completely unrelated to Cottontails really but I just wanted to show you something lovely which I had for Christmas. 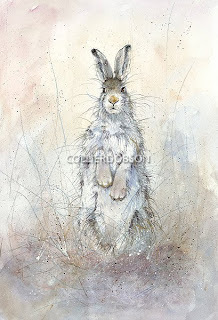 It is a beautiful limited edition print of a painting called 'Mona' by Kate Wyatt. Isn't it gorgeous? You can see more of her work on her website. He had great fun scooting around and digging in the snow while I tried to get him in position - and I just got very cold wet feet running around after him in a skirt and unsuitable shoes! 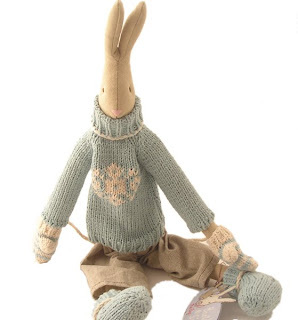 To finish off, and to tie this post into the shop a bit, here is one more rabbit - he was designed by Maileg last winter and I immediately called him Snowflake Bunny because of the design on his jumper. He is also wearing cosy mittens and boots, and as such is much better prepared for snowy conditions than I was this afternoon! Labels: Humphrey, Maileg, Maileg Toys, Rabbity things..
Oh lovely lovely bunnies, I must watch Miss Potter again! Happy New Year Charlotte, I hope you have had a lovely break, are you snowed in? Hope this year brings you lots of happiness and joy. Best sno-bunny yet! Hop on Humphrey! What a lovely rabbity post. I love Humphrey! He's so cute! The painting is wonderful, too. I'm going to visit the site you mentioned. Thank you! It would be great to see you at Top Drawer! Sadly there is no way my bunnies could cope with the underground either- the hate the car too. I see that your Humphrey likes the snow so i may experiment and see if George does tomorrow!! I love the picture of Humphrey in the snow! 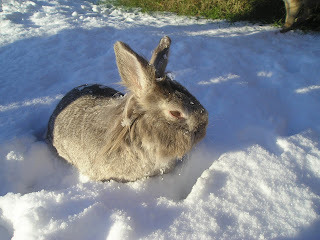 I let Fitzi romp in the snow once and almost lost her - that's what happens when a white bunny plays in white snow! these Rabbits in the snow are awesome! I like it!